All the greatest movies on DVD at great prices! Start your own mail order business! The best entertainment site for lovers of movies, TV shows, music, games and software. 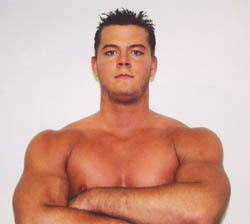 D.H. Smith is the son of the British Bulldog Davey Boy Smith. He began training when he was only eight years old by his father and his uncle Bruce Hart. At the age of 10 DH Smith wrestled in front of a WWF house show. In 2002 Smith got to wrestle with his father in tag team action before his father past away. In 2004, Smith began teaming with T.J. Wilson as the Stampede Bulldogs, a reference to the British Bulldogs, the tag team composed of his father and his second cousin the Dynamic Kid. In the same year, Smith formed a stable known as The Hart Foundation Version 2.0 with Wilson, Jack Evans, and Teddy Hart. The Hart Foundation Version 2.0 initially performed in Stampede Wrestling before expanding to the U.S.A., where they competed in Major League Wrestling. In the beginning of 2005 Smith wrestled for New Japan Pro Wrestling as Black Assassin. In April of 2006 Smith and several of his relatives attended a ceremony as Bret Hart was inducted into the WWE Hall of Fame. While there, Smith met with a couple WWE executives and just like that a few days later he had signed a developmental contract with the WWE. He later started wrestling dark matches for the WWE and would get his first appearance on June 5, 2006 on Raw as he ran out with several other Raw wrestlers to chase out some ECW wrestlers. On February 14, 2007 DH Smith started wrestling for Ohio Valley Wrestling and then later Florida Championship Wrestling when the WWE ended it's relationship with OVW. While there Smith teamed up with his cousins Natalya and Teddy Hart to form the next generation Hart Foundation. He made his television debut under the name DH Smith (the D for Davey Boy Smith and the H for Hart) on October 22, 2007 as he beat Carlito by using his dads trademark move, the running powerslam, the match was dedicated to his father. On November 2, 2007 Smith was suspended for violating the WWE Substance Abuse and Drug Policy. He was suspended for 30 days but came back on December 17, 2007 to beat Charlie Haas on Heat. During the 2008 WWE draft D.H. Smith was drafted to Smackdown but never made his debut as he was sent to Florida Championship Wrestling on August 26. He made the decision to return to FCW on a full-time basis so he could mature, and put more effort into developing his in-ring work and his personality. On October 30, Smith won the FCW Florida Tag Team Championship with TJ Wilson, defeating Joe Hennig and Sebastian Slater, but they lost it to Tyler Reks and Johnny Curtis on December 11, 2008 at the FCW television taping. On April 15, 2009, Smith was drafted to the ECW brand as part of the 2009 Supplemental Draft, without making any appearances on SmackDown. Smith made his ECW debut on May 12, as a villain, attacking Finlay during Finlay's match with Tyson Kidd (TJ Wilson), using the name David Hart Smith. Smith, Kidd and Natalya formed a new version of The Hart Foundation, named the The Hart Trilogy, although on the May 27 episode of ECW, the name was tweaked to "The Hart Dynasty". Smith was victorious in his first match for ECW, defeating Finlay on the May 19 episode, with help from Kidd and Natalya. On June 29, 2009 during WWE brand trades, The Hart Dynasty was traded to the SmackDown brand. Harry Smith is the son of British Bulldog Davey Boy Smith who married Diana Hart, Harry's mother making Bret Hart his uncle so you can say that Harry has the British Bulldog in him and the Hart family legacy in him. Who is your favorite WWE Diva? Who is the most beautiful WWE Diva? Cast your vote! Also pic galleries on the WWE Divas.